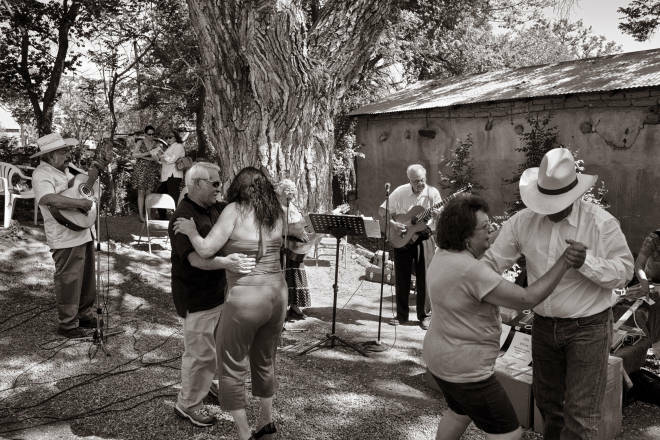 Above: Visitors dance at the Chimayó Museum&apos;s fiesta. Photographs by Don J. Usner. MARTA TRUJILLO MARTINEZ LABORS to lift herself up from her folding chair in the shade of a giant cottonwood along the Acequia de los Ortegas, in Chimayó. She leans on her daughter’s arm as she makes her way to a podium and turns to face the small group of people gathered, rapt in their attention and eager to hear what the respected matriarch will say. Clearing her throat, Marta brings to bear all of her 100 years of experience in this small plaza of northern New Mexico as she recites a poem that rings over the cottonwood leaves click-clacking in the trees and the murmur of the old ditch—sounds that lulled her in infancy and youth and that now harmonize with her soft voice. En tus brazos quisiera morir. As Marta speaks tenderly of her childhood in this small corner of this small town, you can feel hearts stirring in the crowd. When she finishes, she navigates back to her seat beside her viejita cousin, a mere 95 years old. Other relatives, old friends and new ones from Santa Fe, and tourists who happened upon this scene clap their hands and then sit in a deep silence. This tableau—at an event aptly named “Poetry Under the Cottonwood”—could not have been scripted. It seemed to arise as an expression of the spirit of the place, making itself heard above the tumult of the busy world outside this ageless place, one event in a long string facilitated by the Chimayó Museum over the past two decades. Above: Exhibits inside the Chimayó Museum pay homage to the region&apos;s weaving tradition and to it&apos;s families. For most people, Chimayó is known for the 1813 Santuario de Chimayó and its healing dirt, which draws thousands of pilgrims during Holy Week, and for its weavers and woodcarvers. But Spanish settlement began long before the chapel was built, and the Chimayó Valley is replete with historic neighborhoods beyond these well-known sites. The Chimayó Museum occupies a few rooms in an especially well-preserved part of the village, a place where longtime Chimayosos can stroll past buildings and recite the names of the structures’ inhabitants going back many generations. Where they can link those names with handwritten Spanish documents more than 300 years old and with photographs and stories about the people who have lived there. And where locals can gather and see in one another’s eyes the twinkle of kinship spanning centuries. It was a desire to share these rare kinds of experiences that prompted several Chimayosos, including me, to join forces 24 years ago as the Chimayó Cultural Preservation Association. Our first goal was to create a museum, and in 1995 we did so, on the old plaza, with historical artifacts and vintage photographs that help tell our story. That same year, I published a book, Sabino’s Map: Life in Chimayó’s Old Plaza, based on the elders’ recollections of the years before industrialization and the cataclysms of the 20th century radically changed their way of life. Fortunately, many of the buildings held firm, as did the memories of the old ones who lived there, like Marta. Back when the museum opened, this plaza was largely unknown to the outside world, in spite of the fact that historians recognized it as the most intact Spanish colonial plaza in New Mexico. The intactness that they spoke of referred not only to the presence of very old structures but also to the preservation of the plaza form—a rectangular arrangement of casitas, windowless on their outside walls, embracing a central open area. The layout was devised for the defense of New Mexico’s towns and villages when the Spanish colonists and their Pueblo allies faced relentless assaults from Navajos, Apaches, Utes, and Comanches. There was a time when the New Mexico landscape was abundant with these fortified plaza towns, but in most the rectangular layout has been erased by time. 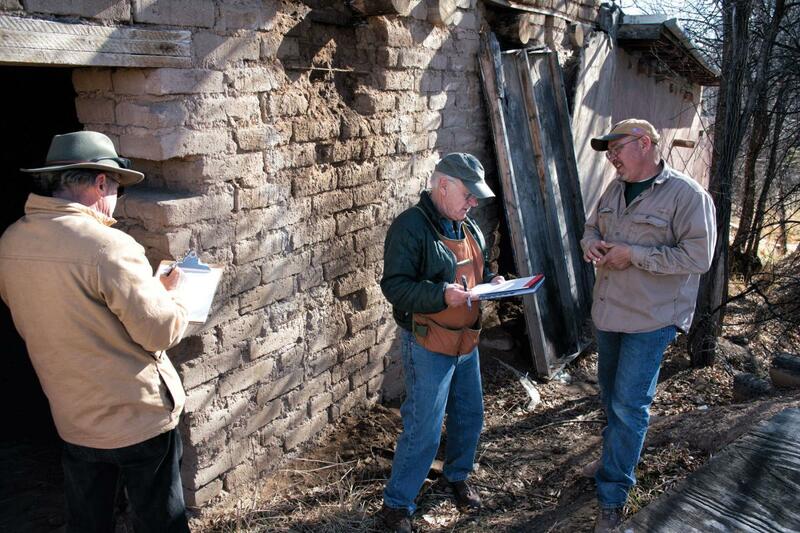 Above: Adobe restorers consult their notes on how to shore up one of Casita Martina&apos;s walls. Perhaps it was for the best that the plaza remained outside of mainstream public awareness. Many people in Chimayó certainly thought so, for their oft-stated fear had been that widespread recognition of the place’s charms would expose it to a transformation that would ruin the quiet, secluded character of it and the surrounding community. Not all of the plaza casitas were abandoned; people still lived there. For residents, tourism presents a double-edged sword, they argued. Even if it generates much-needed economic activity, it can cut sharply into the lives of those whose home environments become an attraction for not always gentle intrusions. When we opened the museum, we recognized that the Plaza del Cerro’s anonymity was a major reason that it had retained an air of authenticity. It was mercifully free of the clutter and hype that so often accompanies the development of historic places. Here, there was no need for signs proclaiming the “oldest” this and the “original” that. You could feel those things in the air. But at the same time, we could see that large parts of the plaza were fading as the elements ever so slowly wore away at them. We wanted to stem what we saw as a heartbreaking erasure of history, believing that to see the plaza fall into complete ruin would be a great loss for the community, but also for all of New Mexico—and, indeed, for the country. No other place so clearly allowed an evocative retelling of northern New Mexico’s Hispanic history. We faced something of a conundrum, then, wanting to preserve buildings, artifacts, and stories but wary of disrupting residents’ lives and opening the community to too much development. It’s a challenge that faces anyone striving to protect and at the same time increase awareness of historic sites, especially in New Mexico, where so many places with deep history are tied to living communities. 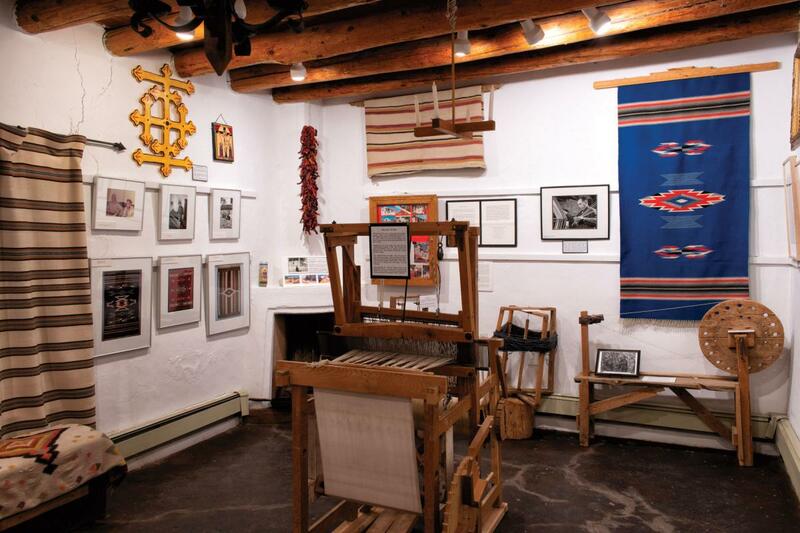 The nearby tourist meccas of Santa Fe and Taos have for many years tried to actively promote visitation while safeguarding the integrity of their historic sites and maintaining a residential presence. Just a mile from the old plaza in Chimayó, the Santuario responded to an annual influx of hundreds of thousands of visitors with development projects that, in spite of the church’s best intentions, have been roundly criticized for being insensitive to the spirit of the place. Leery of repeating mistakes made elsewhere, we aimed for a middle path, making a deliberate outreach to neighbors in the Chimayó Valley even as we welcomed outside visitors. The core of the new museum’s initial exhibit was a collection of historical photographs from the community, bringing to public view the faces and characters of the people who long ago inhabited other old neighborhoods in Chimayó. Just as we had hoped, relatives and descendants of those in the pictures came to look at the photos, smile, and remember their roots, while visitors from other places marveled at the collection’s vivid evocation of a remarkable time in New Mexico history. The museum has since added many programs and activities, including regular lectures, exhibits, and celebrations and a program for teaching traditional arts to local children. Matachines dancers have pounded the dust in the small apple orchard beside the museum, and renowned historians like Thomas Chávez, Michael Miller, and William Wroth have delivered inspiring lectures. Writers like Chimayó native Apolonio Martínez y Ortiz and longtime resident Peter Malmgren have also shared their stories, while northern New Mexican folk musicians have enlivened the yard beside the museum’s horno, built by Chimayó youth to resemble the one where old Doña Bonefacia Ortega used to bake her bizcochitos. And each year the museum has named a notable elderly Chimayoso as a Chimayó Tesoro, or treasure. Marta Martinez received the honor in 2018. The collection of artifacts at the museum has expanded over the decades, too. Hanging on the wall and positioned artfully around the small adobe rooms are evocative pieces such as stone arrowheads, prehistoric pottery, a hand-grinding stone, cribas (handmade winnowing trays), a weaving loom, agricultural tools, a wooden tortilla press, and the piano transported to Chimayó by wagon in 1900 for the first Presbyterian mission school teacher—who hauled it clear from Minnesota. We’ve confined activities to three small rooms of the Ortega house, which are accessed from outside of the plaza, leaving its interior undisturbed. All the while, many of the buildings on the plaza and the neighborhood have continued to sag slowly under the New Mexico sun. Although it’s still reasonable to say that this plaza is the most intact in New Mexico, the definition of “intact” has drifted. Some of the the most significant historic structures—the old general store and post office, the museum, and the plaza chapel—are in good repair. But several plaza buildings have fallen into total or partial ruin, and the oldest one burned down, even as some residences, and a small bed-and-breakfast, have thrived. Shoring up just one building took a lot of help. In 2016, generous donors helped us acquire one of the plaza homes, Casita Martina, and Cornerstones Community Partnerships stepped up to guide its restoration—which also drew in an adobe specialist from Ohkay Owingeh Pueblo and volunteers from Richardson, Texas, and Wellesley, Massachusetts. Everything about Casita Martina, from its rough, hand-applied mud plaster to its raja cedar ceiling, resonates with the spirit of the old plaza. Restoring this one small piece of the plaza has shown us that it’s going to take a village—a village that has grown to embrace a much wider community than Chimayó alone—to recover and protect what remains of the old plaza. If something of this plaza and the neighborhood is to be preserved for posterity, the time for relying on anonymity to protect it from ruin has passed. The Chimayó Museum, 13 Plaza del Cerro, is open Wednesday through Saturday, 10 a.m.–4 p.m., from mid-April through October; in the winter, it is open Fridays 10 a.m.–4 p.m. Inquire there for information about visiting the Plaza del Cerro. You can participate in or witness the Santuario de Chimayó pilgrimage from Good Friday through Easter Sunday, April 19–21. If you’re driving, be cautious of pedestrians. 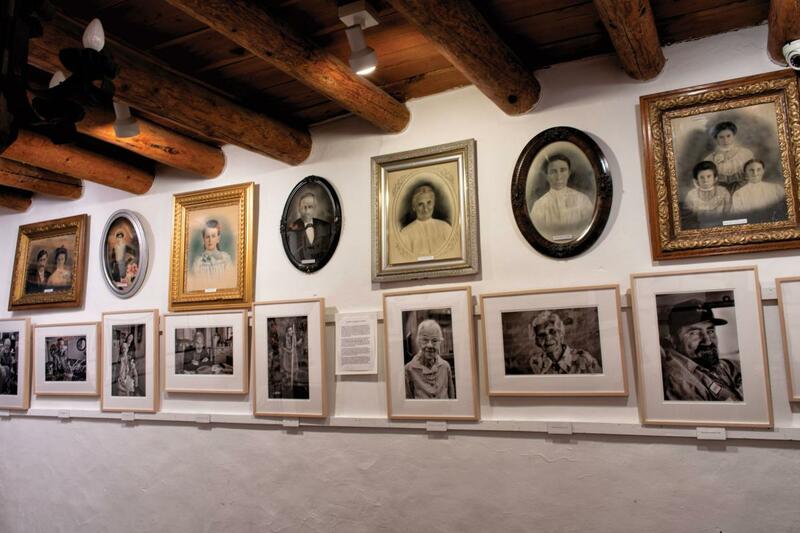 The Hotel Chimayó, in Santa Fe, offers a Magical Heirlooms of Chimayó Day Tour every Saturday, 10 a.m.–3:30 p.m. For cost and details, go to nmmag.us/chimayotour. Pop into weaving shops and artists’ studios in and around Chimayó. When you’re hungry, the James Beard Award–winning Rancho de Chimayó Restaurante will fill you up on red and green. Chimayó historian Victor Dan Jaramillo’s new book, Los Chimayosos: A Community History (Outskirts Press, 2019), breezes readers across the centuries and clues them in to neighborhoods, chapels, and the glory of Chimayó chile. Author Brett Hendrickson’s 2017 book The Healing Power of the Santuario de Chimayó: America’s Miraculous Church (New York University Press) dives into the history of the church and its adjacent chapel, dedicated to the Santo Niño. Don J. Usner’s books about Chimayó include the award-winning ¡Órale! Lowrider: Custom Made in New Mexico (Museum of New Mexico Press, 2016), Chasing Dichos Through Chimayó (University of New Mexico Press, 2014), and Benigna’s Chimayó: Cuentos from the Old Plaza (Museum of New Mexico Press, 2001).